This is a late fall soup that’s been warming us up. Outside there’s a bit of snow on the ground, daylight is short, and we spend more time in the kitchen, slow cooking our food. 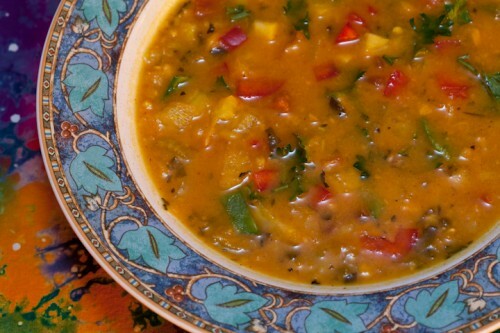 This soup has the warm colors of orange vegetables, flecked with green vegetables. Make a big pot, and I’ll show you some ways that you can brighten its flavor on the second day. The second step is to cook 1/4 cup of brown rice with two tablespoons of seaweed soup mix (see www.theseaweedman.com) and five cups of water for half an hour to make a stock. While the stock cooks, cut up the vegetables for the next steps, and don’t worry if the stock cooks longer than half an hour. The third step is in a soup pot, saute’ 2 cups chopped onions and 3 cloves of garlic (minced) in 4 tablespoons of coconut oil (unrefined) until translucent. Add three cups peeled and chopped sweet potatoes or winter squash and saute’ for five minutes. Add these spices: 2 tsp. Hungarian paprika (sweet), 1/2 tsp. tumeric, 1 tsp. basil, 1 tsp. sea salt (or more) to taste, pepper to taste, a dash of cinnamon, a dash of cayenne to taste, and two bay leaves. Add the rice/seaweed soup stock and simmer for 20 minutes or until the sweet potatoes can be mashed roughly with a potato masher. Do it! The fourth step is add 1/2 cup chopped celery, 1 cup chopped fresh tomatoes, 3/4 cup yellow and/or red sweet peppers, 1/2 cup sliced carrots, 1 and 1/2 cups cooked chickpeas. Simmer for 10 minutes. Add 1/2 cup chopped green beans or peas, and simmer for 5 more minutes. Stir in 1/2 cup chopped parsley and one tablespoon tamari. That’s it! A masterpiece! On the second day, squeeze a lime to make a sweet & sour soup, add cumin and cut corn, or serve with corn chips. Add more parsley. Voila! A new soup!